Ok here it is. After weeks of trawling the internet for Turkish-themed cakes, I found nothing. The fact of the matter is, I've searched for Turkish birthday cakes, Turkish wedding cakes, Turkish cakes, Turkish cake design, Turkish this Turkish that, and got extremely frustrated. All that came up were a bunch of nutty, syrupy, spiced cakes. And nada for custom designed cakes. But, if you type in Moroccan cakes or Arabic cakes, bang! 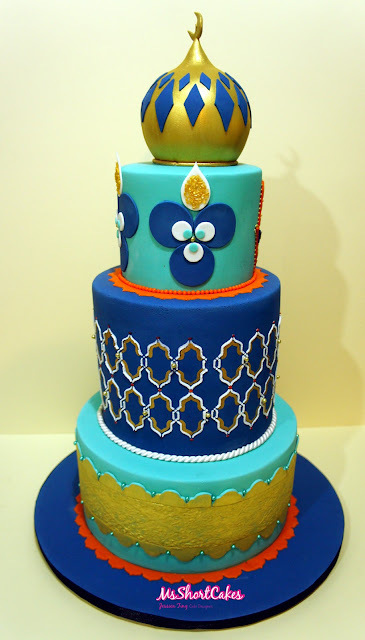 Dozens of photos of colourful and gold embellished cakes suddenly pop up. So I decided, that since there weren't many Turkish-themed cakes out there on the internet, I, Miss Shortcakes will be the first one to post a proper Turkish-themed cake on the internet. To get the ball rolling, I started with research on the fabrics and textiles of the Turkish culture to get ideas. And when I typed in Turkish tiles, most of the results showed me blue, white, and red geometric patterns with touches of floral motifs. The fabrics on the other hand, were generally Persian looking, with rich, deep colours and ornate scrollwork. Choosing the fabric as part of my design, could possibly end up in making my Turkish cake look Arabic. I had to very careful to not do this, as the recepient of the cake was a very particular woman. She had travelled to Istanbul to purchase the decorative items for her birthday party. So under no circumstance, could I turn up with an Arabic or Moroccan cake! Gold minaret topper. I love how the gold lustre came up. I mixed Antique Gold, Radiant Gold and Light Gold to achieve this colour. Once all the hard work was done (ganaching and icing), the fun part was putting it all together. I couldn't wait to start decorating! 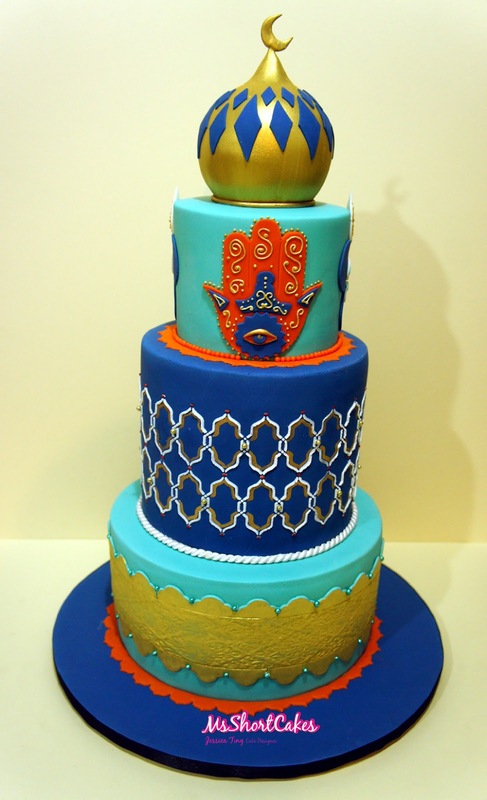 The Hand of Fatima, a must for the cake, in orange. The Evil Eye. It had to be done. I love the blue diamonds on the minaret. A last minute decision, but a good one. Once the cakes were baked, ganached, and iced, I must have spent a solid 7 hours, JUST on decorating alone. Decorating time : 7 hours, straight. That's 14 hours that I can account for, spread over a period of 3 days of actual production. The time that I've spent doing research, designing and sketching, and communicating with the client, prior to production, that I can't account for. Or, find me on Instagram under "missshortcakes". Using part of your design for a cake I'm working on. How did you do the gold minaret and hand of Fatima? The gold minaret was carved from styrofoam and the Hand of Fatima was hand cut from fondant, then piped over with royal icing.